We end the week with Hydreigon from SM Crimson Invasion! A Dark type with 160 HP, weak to fighting, resists Psychic, and a retreat cost of two, it has an ability and an attack. Weed Out ability states that you choose your three Benched Pokemon and these three stays; the others gets discarded. 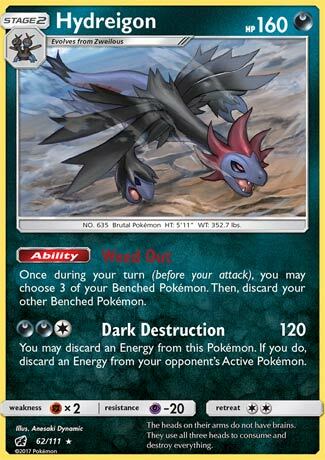 Dark Destruction costs DDC for 120 damage, and an optional effect stating that if you discard an energy attached to this Pokémon, you get to discard an energy from the opponent’s Active Pokemon. Weed Out may seem like a bad idea; why would you discard your Pokemon that has been helping you? At the same time, it’s a good thing to do because you can have room for other Pokemon to be benched. You can remove a Pokémon that just served a purpose such as coming into play abilities and fueling up the damage output of Flareon and Vespiquen (not that you should use both Hydreigon and one of the revengers in one deck). You can also remove a damaged Pokemon away from play, performing a prize denial. Dark Destruction is a nice attack as it hits the near 2HKO mark (Ravaged Field makes a clean 2HKO). Removing an energy can set back a turn, though that doesn’t mean much to Pokemon with unlimited energy acceleration. There are other Hydreigon cards in Standard/Expanded that you may consider using. The DRX 97 has an ability that can move Dark energy around; PHF has an ability that recovers Dark energy; the Break version moves the HP from 160 to 190, change from Dark to Dragon, and adds a attack called Calamity Blast that costs PDDC for 150, and 50 to 2 of your opponent’s Benched Pokemon. With good other options, Hydreigon may be forming its own deck! Overall, another nice option for a Hydreigon card to use! We end the week with Hydreigon (SM: Crimson Invasion 62/111). I’ll start with its Ability, “Weed Out”; once per turn, before your attack, Weed Out has you pick three of your Benched Pokémon before it discards the rest. Your Bench capacity remains the same; this just allows you to discard Pokémon that aren’t helping you anymore, freeing up space for something new. This makes Weed Out useful for clearing out Pokémon you no longer need in play, either because they’ve served their purpose or are currently too much of a liability. Make sure you really understand how this works; you’ll be able to discard a Bench of any size down to three. Even if you wanted to keep more. Likewise, if you wanted to keep less, too bad; you’re keeping three. Remember what you pick is what you keep. Though this Ability looks great for just about any modern competitive deck, Hydreigon is a Stage 2 Pokémon. I’m old enough to remember the days when you could easily slap a Basic and its Stage 2 form into a deck, often alongside yet another Stage 2, and Rare Candy plus the pacing of the game meant it didn’t just work, it was the standard operating procedure! Unless we get some almost scarily powerful and fast tricks for Stage 2 Pokémon, this Hydreigon or another version of it will need to be your deck’s focus, either as an attacker or a Bench-sitter. Being a Darkness Type might help with either; while not great for Weakness/Resistance pairings, they still have a decent amount going for them in both formats, with classic power plays like Dark Patch in Expanded. The 160 HP is promising, as it means an Active Hydreigon has an actual chance of surviving an attack from your opponent. Unless it is a [F] Type, because of its [F] Weakness; you’ll be lucky to avoid a OHKO there. Slightly better odds against [P] Types due to [P] Resistance, but remember quite a few of them focus on something other than straight damage (damage counter placement or other effects). The Retreat Cost of [CC] is high enough you don’t want to pay it but low enough you probably can if you must. So does Hydreigon have an attack worth the investment? “Dark Destruction” needs [DDC], and allows Hydreigon to do 120 damage. It also gives you the option of discarding an Energy from Hydreigon itself, and if you do, that then allows you to discard an Energy from your opponent’s Active. Three Energy isn’t an easy amount to hit, especially when two units of it are Type-specific, but it’s doable. 120 for three is good but not great; not high enough to be worth building up, but at least 2HKOing most things without outside help. Cards directly related to Hydreigon are Deino (its Basic Stage), Zweilous (its Stage 1), Hydreigon BREAK, and other Hydreigon. You have to run Deino, and the best seems to be SM: Crimson Invasion 60/111, simply for its 70 HP; others have better attacks, but not what you’d actually call good attacks. The Zweilous are even less impressive, all having 80 or 90 HP and mediocre attacks; even when an attack does something useful and isn’t badly overpriced, it still is when you remember the attack is on a Stage 1 you need to survive so it may Evolve. The only reason you’ll be running is that I don’t think it is safe to run just Rare Candy alone. In Expanded, the other Hydreigon with Abilities might help out today’s version, but none of the ones that are pure attackers are worth backing up. Hydreigon BREAK might be an option, but mostly just to gain more HP as its attack is very costly. You can build a deck around today’s Hydreigon, but I’m not sure what to use as the main attacker. The big draw would be spamming coming-into play effects, before discarding those Pokémon from your Bench. There are enough Pokémon recycling options that this could prove profitable, but probably not enough without a better attacker than Hydreigon. Expanded might work better, though; besides Dark Patch, you can spam Shaymin-EX (XY: Roaring Skies 77/108, 106/108) for draw power, before discarding its small, 110 HP self. Sky Field allows you to have a temporarily massive Bench, as well. I thought about using it for your typical [D] Type deck in Expanded, but it might just be more effective to use that effect from Parallel City on yourself to shrink down your Bench… which brings us to another issue; other decks using Parallel City and/or Sudowoodo (SM: Guardians Rising 66/145) to shrink your Bench. If you can pull the line and can afford to run on mostly basic Darkness Energy, Hydreigon looks very good for the Limited Format; just pray you don’t crash into a +39 deck built around Buzzwole-GX or Guzzlord-GX. Finally, the “Destruction Fang” Theme deck features a 3-2-2 line of this set’s Deino/Zweilous/Hydreigon. I haven’t been playing the PTCGO as much lately, so I haven’t gotten around to buying this Theme Deck, but I’ve faced it many times and it joins the ranks of competitive SM-era Theme Decks… well, for the Theme Format of the PTCGO. The deck has quite a few Fighting Weak Pokémon, but – also true in the Limited Format – you may find you need to Bench and discard some cards just to thin your hand. The Theme Deck contains Bewear (SM: Guardians Rising 113/145) and an Oranguru (SM: Black Star Promos SM13; Sun & Moon 113/149); so not only draw power but draw power which combos with Weed out! This is the best place to use Hydreigon. We’re still covering cards that were nominated for but didn’t actually make the top 10 list from SM: Crimson Invasion. Hydreigon managed a sixth-place finish on one of the crew’s personal top 10’s, earning five voting points; if we’d done a top 15 for SM: Crimson Invasion, that’s enough to have taken 14th place! I’m not sure why, though, because it didn’t make my own top 10 (or even top 15); Weed Out is great, but not on a Stage 2 Pokémon.